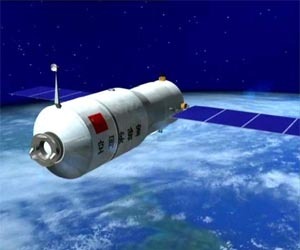 Artist’s conception of the Tiangong-1 experimental space station module (Source: Xinhua). According to Xinhua, the first Chinese space station module Tiangong-1 has reached the desired 363 kilometers high orbit. All the systems appears to be in good condition and all tests went on fine during the first days of orbital activities. The unmanned module, Tiangong-1, or Heavenly Palace-1, was launched on Sept. 29 from Jiuquan Satellite Launch Center in northwest China’s desert area, on top of a Long March rocket. According to the press release, during its first 109 orbits, the station completed testing of remote control system, video/audio equipments, temperature/humidity sensors, docking facilities and other functions. The Jiuquan Lauch Center is now preparing for the launch of the unmanned Shenzhou-8, scheduled by later this year. It will be the first Chinese attempt at docking.